We can make custom air coils based on your drawing, design, specifications. If you have a drawing or sketch, we will wind for you. 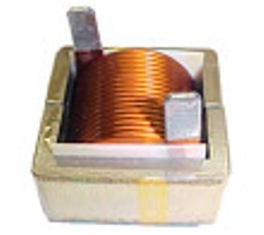 CWS manufactures all types of air coils inductors, from round diameter wires in AWG #36 to AWG#8, and rectangular sizes of 72 mils x 182 mils and 95 mils x 182 mils. In many cases, the windings are done using 200 deg C class wire insulation for high temperature application. This formula in the above .PDF file is most accurate when the coil length is greater than 0.67 of the radius and the frequency is less than 10 Mhz. As the frequency goes above 10 Mhz, parasitic capacitance causes the formula to be less accurate. Q changes drastically as a function of frequency. At lower frequency, Q is good as only the DC resistance has an effect. As the frequency increase, Q will increase up to a point when the skin effects and the distributed capacitance begin to dominate. Then, Q will decrease till it reached zero at self resonance frequency. 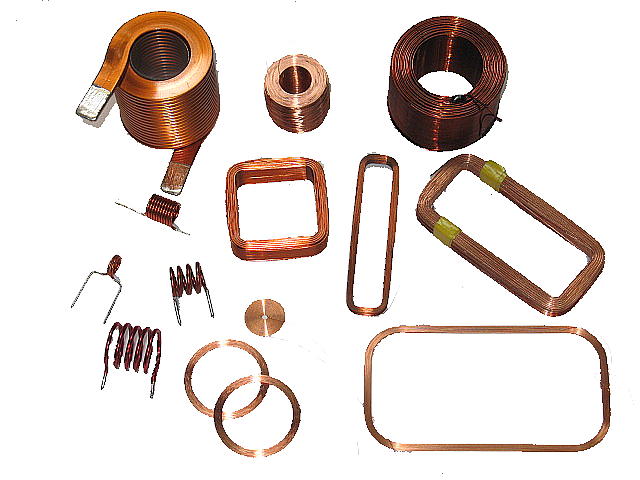 Q can be increase by decreasing the windings resistance ( using heavy gauge wires), spread the windings to lower distributed capacitance and using a iron or ferrite core to wind over to increase the inductance. An Air Coil Winding chart can be downloaded from the .PDF file below. This chart shows the air coil inductances with various number of turns, diameter and length. Contact CWS for high quality custom winding jobs at a reasonable tooling cost, and low cost volume production.